Hunters with the Oregon Department of Fish and Wildlife are searching for the cougar that killed a woman near Mount Hood. The woman apparently tried to fight off the mountain lion with repellent, a sharp object and a stick, according her sister. 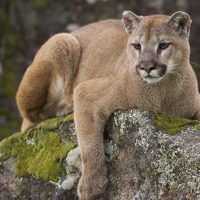 If the hunters find a cougar, they will kill it and check DNA to determine if it’s the big cat that attacked the woman. There’s a chance cougars that haven’t hurt anybody could be killed in the process.